TOLEDO, Ohio, August 7, 2018 – SSOE Group (www.ssoe.com), a global project delivery firm for architecture, engineering, and construction management launched a newly redesigned website today. This week, the firm is celebrating 70 years of making clients successful. The new website features a “project portfolio” to highlight SSOE’s wide breadth of project experience in a number of industries and regions around the world. The firm’s projects, people, diversity, and collaborative culture are highlighted. Visitors to the site will discover a plethora of articles by SSOE’s industry experts along with helpful information on project execution strategies. 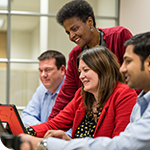 With much of the site’s traffic coming from potential employment candidates, enhancements were made to the careers section to provide a clear view of what it’s like to work for SSOE while building efficiency into the application process. View the new website at www.ssoe.com.